Porsche 550 Spyder in the Mercedes-Benz Museum Source: © 2019 Daimler AG. All rights reserved. USPA NEWS - How strange! What’s a Porsche 550 Spyder doing in the Mercedes-Benz Museum’s racing corner? This photomontage of the first racing car from Zuffenhausen surrounded by Mercedes Silver Arrows is an anniversary gesture to the Porsche Museum: “Good friends are always welcome.” The Mercedes-Benz Museum is combining its congratulations on the occasion of the Porsche Museum’s tenth anniversary on 31 January 2019 with an invitation: we are offering Porsche employees free admission to the Mercedes-Benz Museum for ten days until 10 February 2019. Since 2016, the two museums have been collaborating with discounted admission rates. 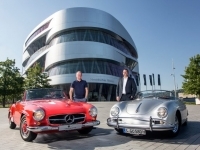 Both Stuttgart-based automotive museums have been collaborating as part of a close partnership. Just one example is their admission-based collaboration, available since 2016: visitors showing the corresponding admission ticket of the other museum receive a 25 per cent discount on the regular admission rate. The Mercedes-Benz Museum’s permanent collection features several vehicles from the era dominated by Porsche. These include the 1924 Mercedes Targa-Florio racing car (Myth 7 room), the 1927 Mercedes-Benz 12/55 hp (Collection 1 room) and the Mercedes-Benz Type SS compressor sports car introduced in 1928 (Myth 3 room). Since the market launch as an automotive manufacturer after the Second World War, Porsche has also made itself a name in motorsports. Both brands continue to be very successful at various events and also directly compete with each other for the top spot. For instance, in the past, the Porsche 550 Spyder has raced against the Mercedes-Benz 300 SLR at Mille Miglia 1955. 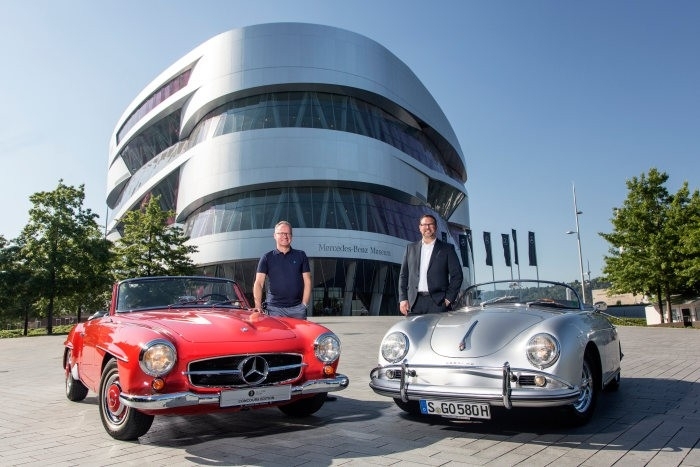 Porsche and Mercedes factory teams will also be competing against each other in Formula E.
The Mercedes-Benz Museum is open Tuesdays to Sundays from 9 am to 6 pm. Last admission is at 5 pm. Registration, reservations and latest information: Monday to Sunday from 9 am to 6 pm by telephone on +49 (0)711-30000, by email to classic@daimler.com or online at http://www.mercedes-benz.com/museum.